Good morning! I wanted to share some reflections on my Marine Corps Marathon training based on questions I’ve gotten from you guys over the past couple months. Can’t believe it’s already been a week since I ran my third full marathon! 1) Would you change anything about your training? In terms of the actual training, I wouldn’t say I totally nailed it, especially because it was so hot out for most of my long runs, but I got most of what I was supposed to done, including a 20 mile training run and a 22 mile training run. I felt prepared for race day having gotten those in, and had I not decided to climb a mountain the weekend before the marathon (still don’t regret that, though), I think I could have had a decent performance on race day (although the heat would have been a factor had I been racing). I’m a very low mileage runner compared to a lot of my friends – I’m not sure what my biggest total mileage week was because I didn’t track it but I’d guess it wasn’t much over 30 miles. I know that’s super low, but it works for me – any more and I get injured/burned out. If you’re aiming for speed and really trying to crush some goals during your race, you probably want to consider doing more, though – I’d have a coach help you figure out what works best for you. 2) Any tips for post long run recovery? I also iced my knees, ankles, feet, and calves constantly – usually a couple times a week, plus after long runs (I use Paradice Packs – the cuff – and they rock). And I started doing ice baths (immediately post-run) once I reached about 14 mile+ runs, and that really helped with recovery as well. If you don’t have time for a post-run ice bath, try an epsom salt bath later that evening before bed! 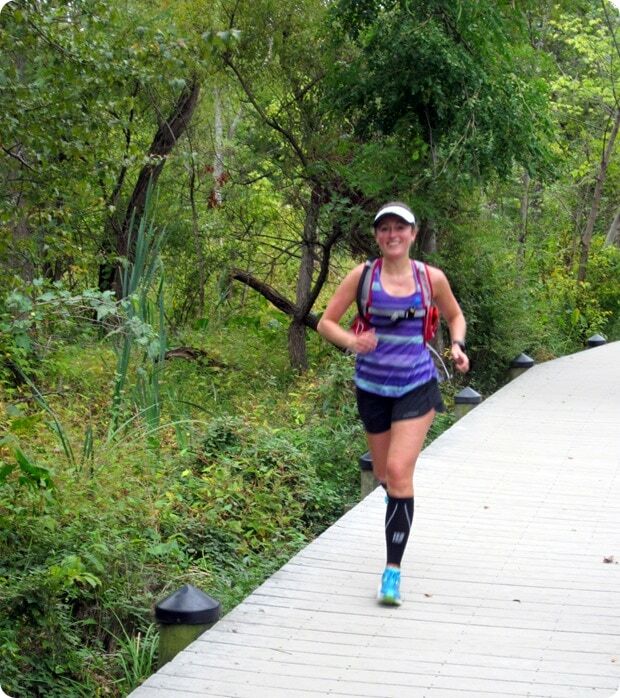 In addition, I wore compression sleeves during my long runs and compression socks around after long runs, on planes when traveling, and occasionally during the week when I felt like I needed them. This also really helped with recovery! Last thing: I treated myself to a massage once per month. So worth it. 3) What did you eat during/before long runs? Before long runs, I usually ate toast (either regular or paleo bread, depending what I was in the mood for and how hungry I was – paleo bread has more staying power) with almond butter and sliced banana, plus half a serving (since I was always about to head out the door and didn’t want too much liquid) of Vega Pre-Workout Energizer. 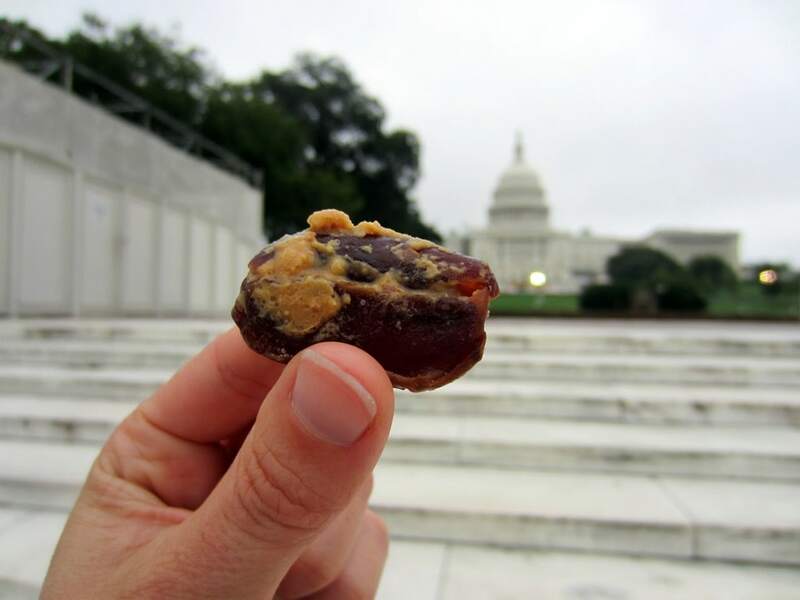 During long runs, I had a mix of Margarita shot bloks (delicious and salty) and my Nut Butter Stuffed Salty Dates when I wanted real food. I occasionally worked in a mocha Clif shot gel at the start of the run for caffeine, too, and I always wore my water-filled hydration vest – on the longest runs, I drank up to all 2 liters of water. 4) How did your overall appetite/diet change while training? I didn’t really change the composition of what I was eating much, but I definitely ate more food, especially on long run days and the day after long run days, where I found myself to be really hungry. I follow an intuitive eating approach to eating as you know (which is what I work with my AnneTheRD clients on as well), so I just made sure to eat when I was hungry, even if I felt like I was eating a lot. I also made sure to refuel immediately after long runs so I didn’t get hangry. :) I usually left an almond butter perfect bar or something in the car to have on my drive home, and then I’d shower and have a real meal after that. I found myself craving red meat and protein a lot more than usual, which makes sense since my body needed it. I’m much more of a savory/salty person in general, so my cravings were mostly things like burgers and fries. :) I’d take that any day over a sweet! A break!! I’m not gonna lie – I’m totally over super long runs and I think full marathons and I are going to take a nice long break. I know a lot of it was circumstance – having to do many long runs alone or partly alone, and squeezing them in on weekdays when I didn’t have a ton of time was not my favorite thing ever – but I also just felt like it really wore my body out this time in not a good way. (Again, a lot of that may have just been that my plate was too full in general with all the travel – and without consistent long run company my long runs seemed longer and more exhausting. Plus, it was SO HOT during most of my long runs and that also really drains me – I definitely prefer cold weather training.) 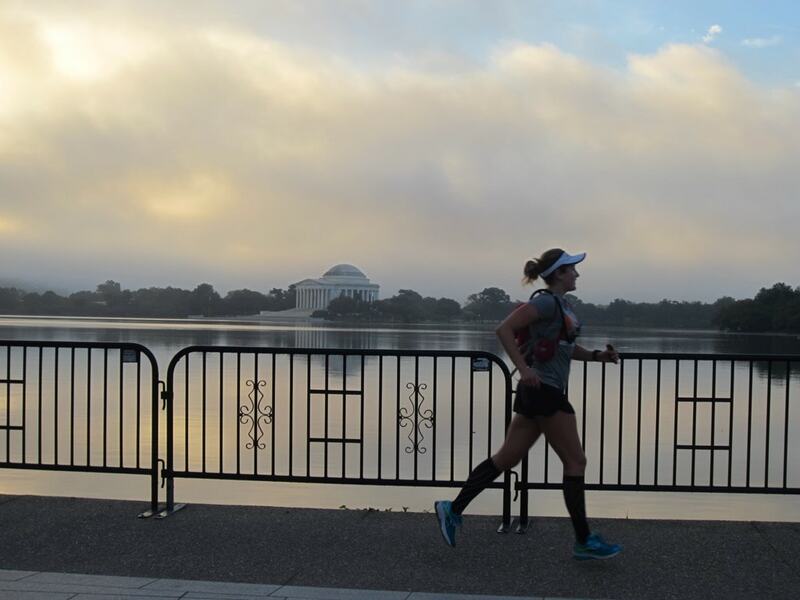 Basically – I’ll always love half marathons and below, and my body seems to like those distances a lot more, too, so I’m planning to stick with them for the foreseeable future. 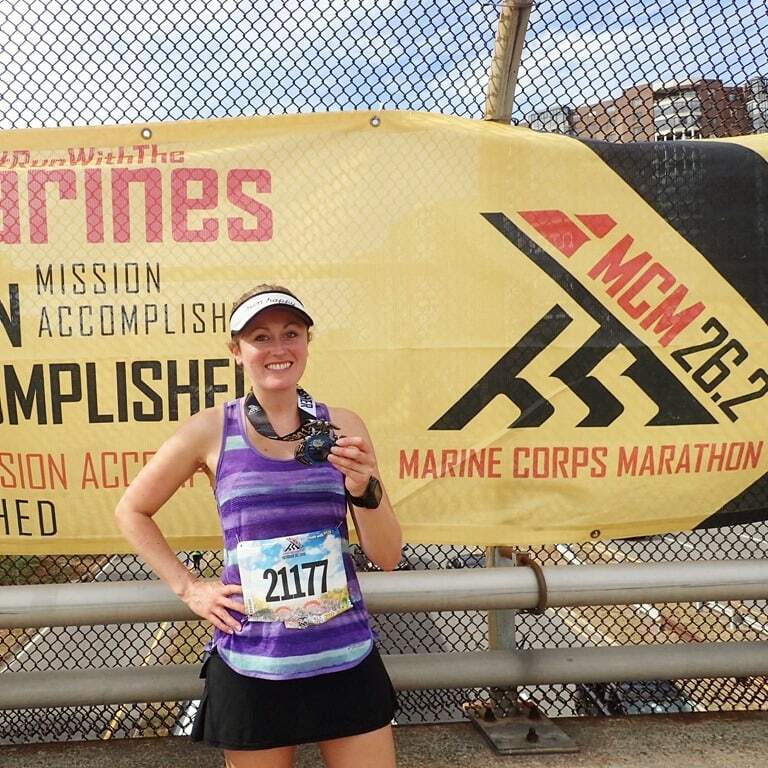 I’m really glad I did the Marine Corps Marathon (it’s been on my bucket list for years – I actually wanted it to be my first marathon but my training buddies and I had a conflict for that weekend) and I am so thankful to have had the opportunity to do it – but I’m officially burned out. 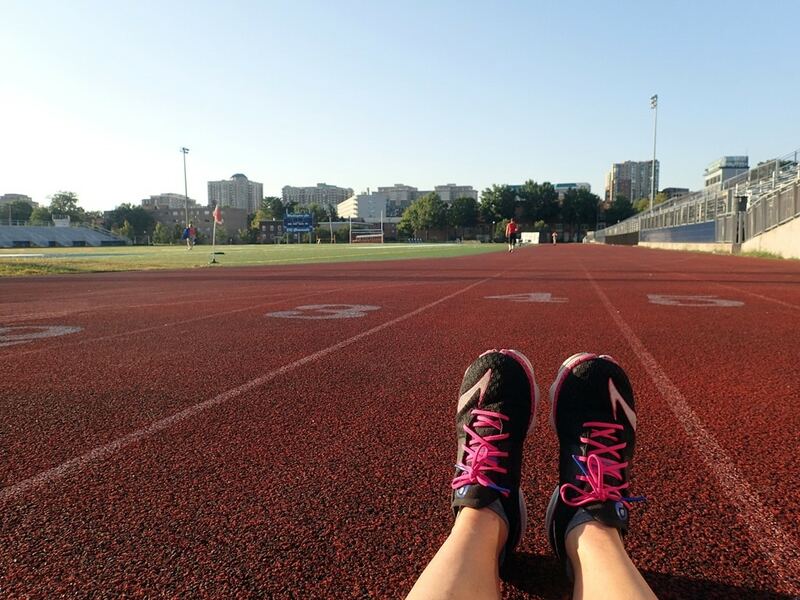 Don’t worry, I still love short runs – but I’m REALLY excited to work in boot camps and yoga much more often again and to dial down the running! I’m also just excited to have more flexibility with workouts – it’s been hard to get to some of my favorite strength classes and to meet up with workout/non-marathon training running buddies because I was constantly resting up for or recovering after a long run. 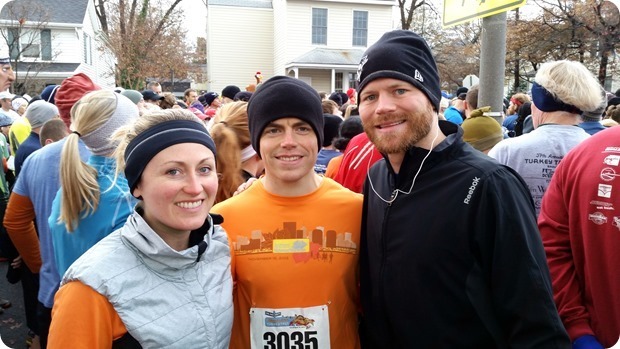 As for my next race on the calendar – it’s a 5 mile turkey trot on Thanksgiving Day with Matt and my brother Steve! :) We run the Alexandria turkey trot anytime we’re in the DC area for Thanksgiving – it’s great. Looking forward to it already! Thank you guys so much for following my Marine Corps Marathon training journey and for providing support, encouragement, tips, and advice along the way! I appreciate you so much. :) Let me know if you have any other questions I missed – happy to answer them! I’d also love to hear any reflections/lessons learned from your own training – feel free to share! Want to read all my previous marathon training related posts? Click here: marathon training – that will pull up all the posts I tagged as marathon training related. And in the future, you can find that link on my right blog sidebar in my “categories” drop down menu. Please note there are affiliate links in this post. congrats on a great race. for me it’s the same thing, its hard to say no to LIFE when i am training for something but it ends up draining you in bits and pieces along the way. congrats again on the finish!! Where did you get your monthly massage? I’m training for a half-marathon and am super injury prone so I am thinking about incorporating massage into my plan. I go to Massage Envy – I do their monthly membership so it’s like $70 a month for one 60 minute massage a month. Totally worth it! I also highly recommend Bye Bye Stress in Clarendon – Great massages and super affordable – no frills! Congratulations on your finish-great job! I loved reading your recap and what worked/didn’t work for you during training. I ran my first full marathon in July (San Francisco) and also followed a 3 day/week training program. Like you, the reduced frequency and therefore mileage just fits me and my body better and after years (more like over a decade) of repeated overuse injuries, I finally went through an entire training cycle making it to the starting line injury free. My next race is a Monterey Bay half marathon on Sunday and my next full marathon isn’t until Big Sur in April. I think one full marathon a year and a couple of halfs is my sweet spot. That’s awesome! Have fun at the half marathon on Sunday! Fitting in the long runs can be so tough when life gets busy! The juggling of the training sometimes makes me go crazy! Hmm, I may have to try the ice bath thing! Couldn’t hurt right! Definitely – ice baths are awesome! I feel like after every marathon training cyle I need a good break. That burnout feeling is real. I wish I craved more protein foods when I’m training, instead I want all the chocolate. Awesome reflection! PS I totally bought that hydration vest and LOVE it, I can’t believe I waited so long to buy one, especially in the AZ heat! Thanks for always linking your gear! I figured you liked yours so I didn’t even waste time researching them all (time is precious right?) so I just bought the one you linked to no questions asked. Worked out well for my 12 miler, now just trying to decide if I want to race in it or not! So glad you like the hydration vest, too! It’s the best!! If you have trained it in, I would definitely race in it – you’re used to it! Plus, it will ensure you drink enough water – I tend not to get enough water at the water stops! Congrats on the marathon! I think I noticed less gluten-containing recipes and meals on your blog (e.g. paleo bread). Is it something you are experimenting with? With the paleo bread, I noticed it tided me over better for long runs (makes sense – more protein/fat). In terms of dinner – yes, we have been eating mostly gluten free lately at home because of a medical condition Matt has been dealing with – I’m going to write more about all that stuff next week once I’m home from this trip. Stay tuned. Thanks for your response! I must admit that a few years ago I was a little judgemental about many friends and family members giving up gluten, knowing they were not celiac… I decided to try a gluten-free diet back in September – mostly as an experiment, for fun, to diversify my diet – and to my surprise, some symptoms I had been having for years like joint pain, foggy brain, etc are 85% gone. 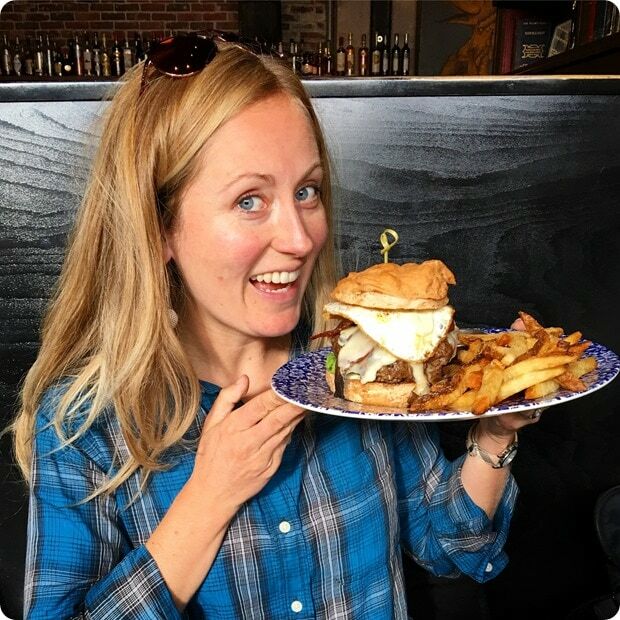 I know I should be tested for celiac disease and avoiding gluten makes it difficult to diagnose but I feel so good off gluten that it’s kind of scary to start eating it again… Anyway, glad we may see some more gluten-free recipes on your blog! 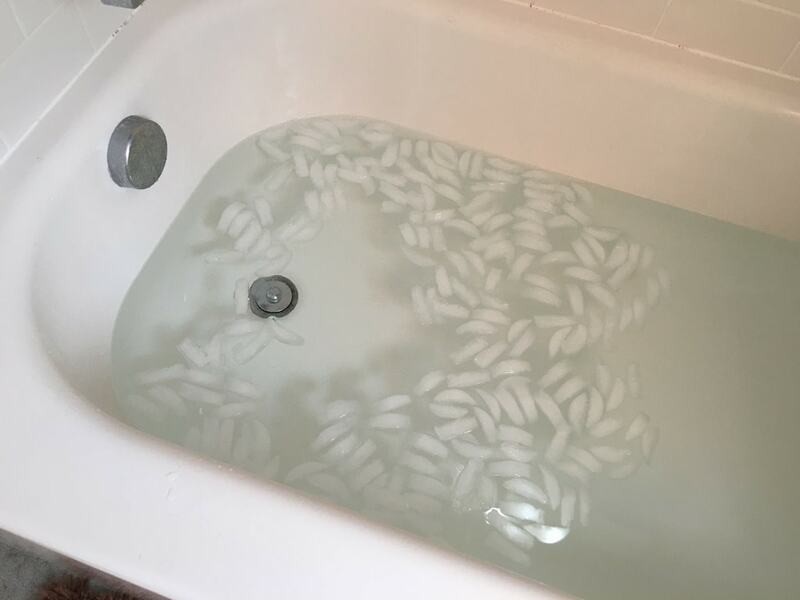 when you make your ice baths, do you test the temperature? how much ice? do you just get a back from the gas station? Happy to have helped, Liz! :) Thanks for reading! Very useful, forthright reflections, Anne, thanks! I’m running my first ever marathon on Saturday! I first read about the Richmond marathon in your first marathon recap when I was 18, and two years later I’m taking it on myself! I’m nervous and excited and just so thankful for all your recaps and positive running advice. 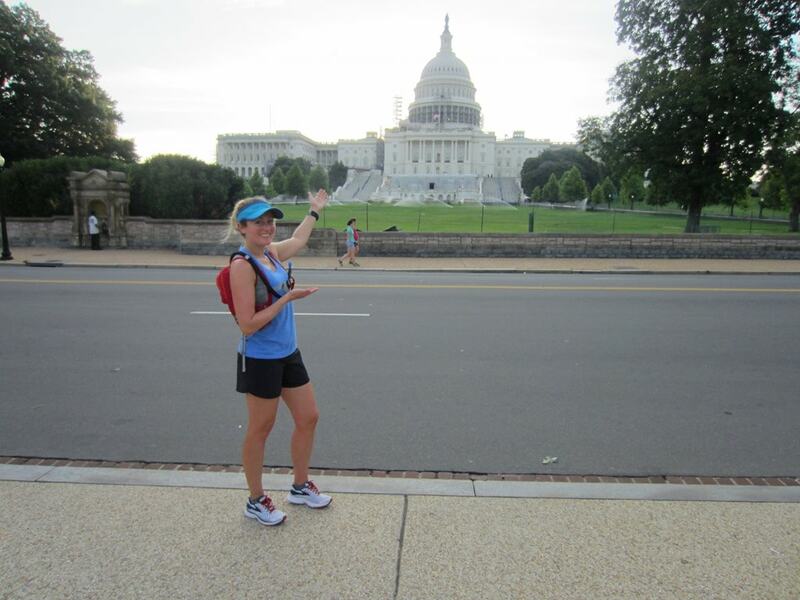 I’ve been training at school for a lot of my runs, so seeing all your pictures of D.C. reminds me of home when I’m away and I miss it so. I’m also looking forward to getting back to more strength training and other types of workouts. Ahhh, so excited!! !